Here’s a quick video I shot with Carnet Williams giving me a demo of the Aquaglide aluminum adjustable length stand up paddle. The adjustable handle moves in 2 cm increments and secures in place with a snap-lock fitting. Last week I ran into Candice Appleby at the Surftech shop where she showed me one of the new prototype boards that she is working on with Randy French. These new boards, an 8′11″ and an 8′4″, are going to be signature Surftech models designed for high performance surfing according to Candice. 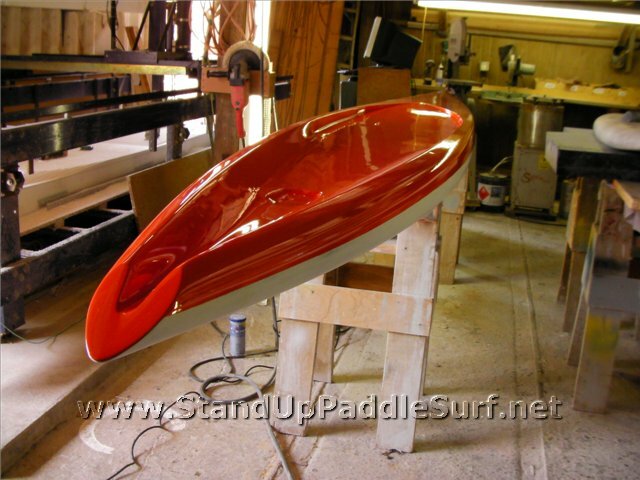 Here’s a video of Candice with a quick overview of the 8′11 “ripper” stand up paddle board. 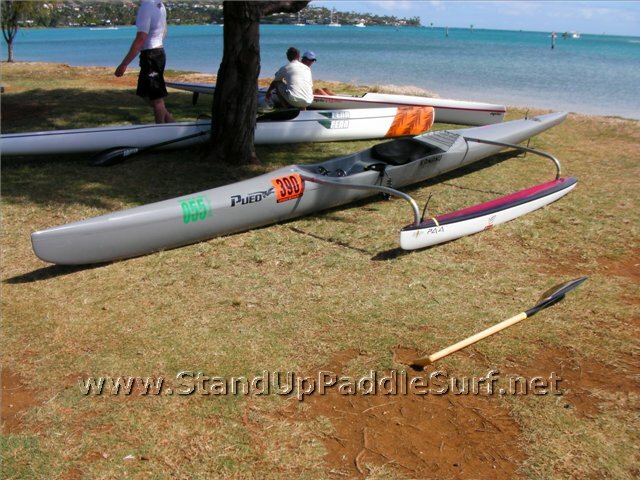 Here are some more pictures from the 2010 Maui to Molokai Challenge sent to us by Karen Baxter. Congratulations again to Connor Baxter for winning the Stand Up Solo division and to Mark Raaphorst and Jeremy Riggs for winning the Stand Up Men’s Relay division. I’ve taken my kids to 2 of these and they had a blast. I highly recommend Na Kama Kai, especially since the price is right. May 19, 2010 (Reno, NV) – Dan Gavere (Hood River, OR), arrived in Reno Nevada last weekend for the Surftech Rally on the River SUP Race, with two objectives, 1) to catch up with his long time whitewater buddies and charge the river with them, and 2) to take it to them in the “Rally on the River”! He did both… in that order. Congratulations to Antoine, who fought off the cream of stand up paddlesurfers, to win the second event of the Stand Up World Tour. When I was in Maui a couple months ago I saw Jack Dyson’s new F-18 being made. Mark Raaphorst said that it was designed for flatter conditions on the south shore in Kihei. Here’s a video I shot while at SIC. The Honolulu Triathon proved to be a successful event for many of the Planet Sun collective. 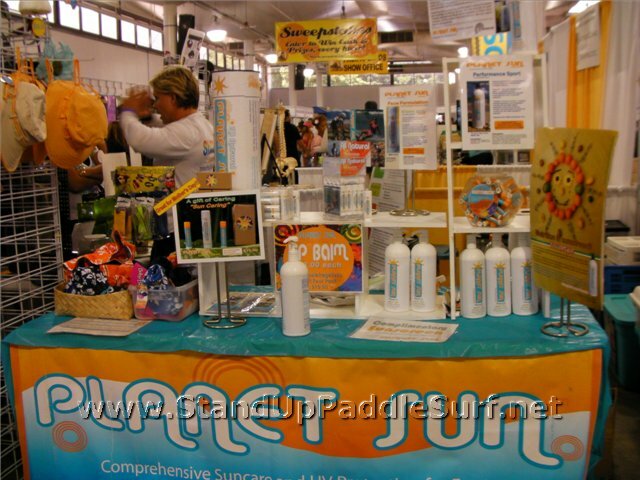 Planet Sun served as suncare provider to the event with many supersized Team Pumps of our PerformanceSportFormulationOne sunscreen for the masses. Mike and Sandy Ferreira continue to shine on, each with 1st place age group finishes. Mike placed 4th overall, boasting the second fastest bike leg of the day. Multi-sport Mermaid, Trish Havey, finished a remarkable 13th overall/6th of all wahanie/2nd in Age. Planet Sun Principals, Paul Sibley and Jeff White, laid it down too- Jeff with a hard earned 3rd place in age. We also unveiled the new Planet Sun UV and Elements Protection Sleeves at the venue to much interest and acclaim. Pics of Mike and Sandy. - Special Outrigger Hotels Room Rates ! - Board & Equipment Shipping Container being organized from California. 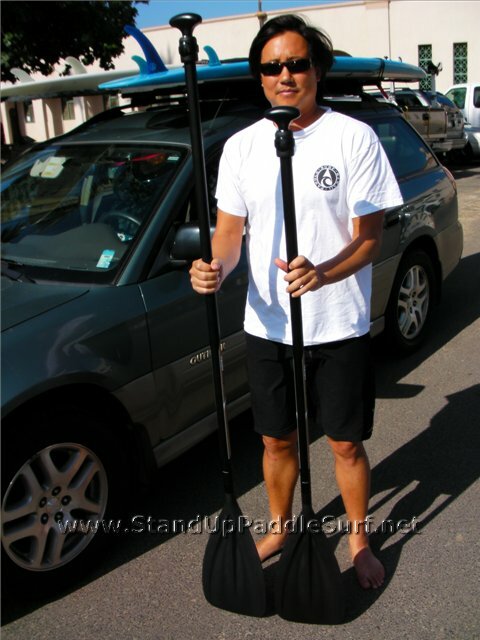 - Don’t miss out on the SUP Expo ! - The Elite Race is open to everyone. IMPORTANT EVENT UPDATES BELOW ! HONOLULU – May 13, 2010 — There is a point, part-way across the Molokai Channel, where land cannot be seen on the horizon and the 2,300 feet of ocean beneath you no longer seem buoyant. It is around the 10-mile mark of the 32-mile crossing, and it’s at that time that even 8x defending Molokai2Oahu paddleboard champion Jamie Mitchell (Australia) starts to feel very much alone. He has found himself there every year for the past nine years and this summer will tap into that feeling of isolation to raise $10,000 for some of the world’s most isolated island populations. I was talking to my friend Jason tonight and trying to explain over the phone how to catch bumps on a downwind run. This game at ocpaddler.com is a very good tool to understand the timing needed. It may not make you a pro but it will give you the idea of how to catch bumps. Check the game out here http://www.ocpaddler.com/game and let us know if it helps. I recently went to the 2010 Hawaii Spring New Products Show and got a change to meet up with John O’Malley, president of Planet Sun Hawaii. I’ve been using their sunscreen lately and like it a lot. Here’s a video where John talks about the Planet Sun skin protection products and UV protection in general. May 11, 2010 (Santa Cruz, CA) – Surftech is proud to announce the addition of Candice Appleby (Honolulu, HI), to their already stellar SUP team. Candice joins Legendary waterman and stand up paddle pioneer, Laird Hamilton, 2009 Rainbow Sandals Battle of the Paddle winner and 8 x Molokai to Oahu Paddleboard Race Champion, Jamie Mitchell as well as rising SUP star, Slater Trout of Maui Hawaii. 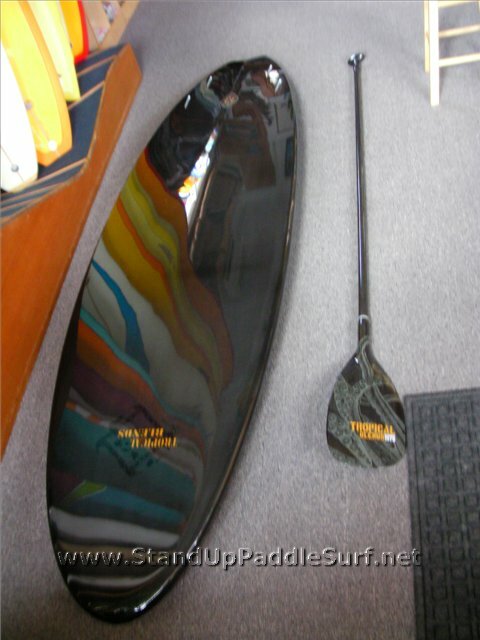 Jim over at Tropical Blends showed me the next generation of SUP’s made out of carbon fiber. I took these pictures with my iphone a while ago and finally got them off the phone. Sorry if they are a little blurry. 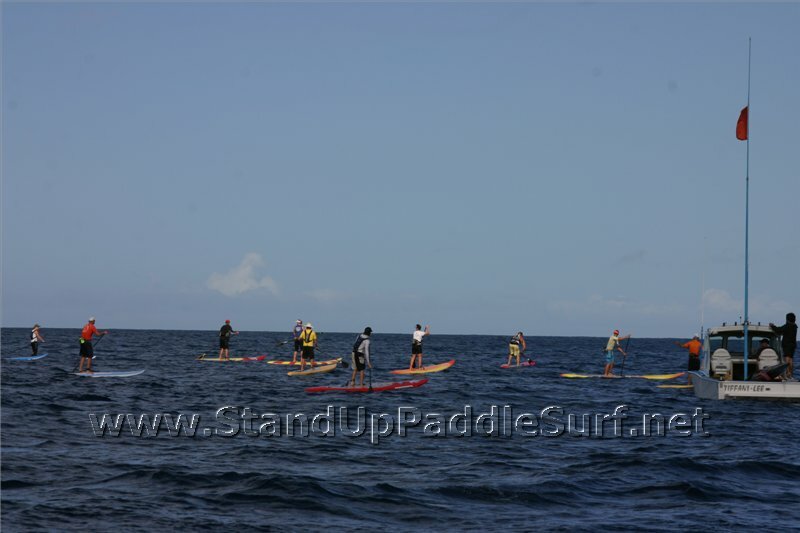 You are currently browsing the Stand Up Paddle Surfing in Hawaii - StandUpPaddleSurf.net weblog archives for the month May, 2010.